• Happy Holidays from Chronic Logic! • Bridge Project Bundle on Sale! • Bridge It climbing the charts on Steam Greenlight! Chronic Logic would like to wish you a safe and happy holiday season! If you are still searching for presents for the holidays our downloadable games can be given to anyone with an e-mail address. They make great last minute gifts. Bridge Project Bundle on sale! The Bridge Project Bundle includes all four of our Bridge Building games, and is by far the best bridge building deal for your dollar. 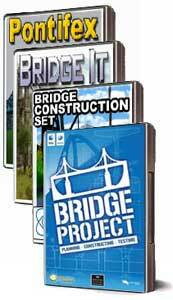 Get Bridge Project, Bridge It, Bridge Construction Set and Pontifex and save $28.85. These games include hundreds of bridge building challenges sure to keep you entertained well past the holidays! Check out the Bridge Project Bundle here. Bridge It climbing the charts on Steam Greenlight! Bridge It is now ranked #37 on Steam's Greenlight but we need your help! If you have a Steam account you can vote to have Bridge It added to Steam! If you have Steam friends, a blog, twitter or facebook account you can also help by sending more people to vote for it. See our Facebook and Twitter to share posts and RT tweets. You can make Bridge It become the first Bridge Building game on Steam! New Bridge Building Game, Bridge Project Available! Bridge It Add-on Bundle now available! Bridge It updated to run on non-Nvidia graphics cards!